This is the eighth post in a series about Asian American church models. Dr. Benjamin Shin, in a lecture for the Doctor of Ministry in Asian American Ministry at Talbot School of Theology, discusses these different models. Photo by ©HTO3. Used in accordance with Creative Commons. 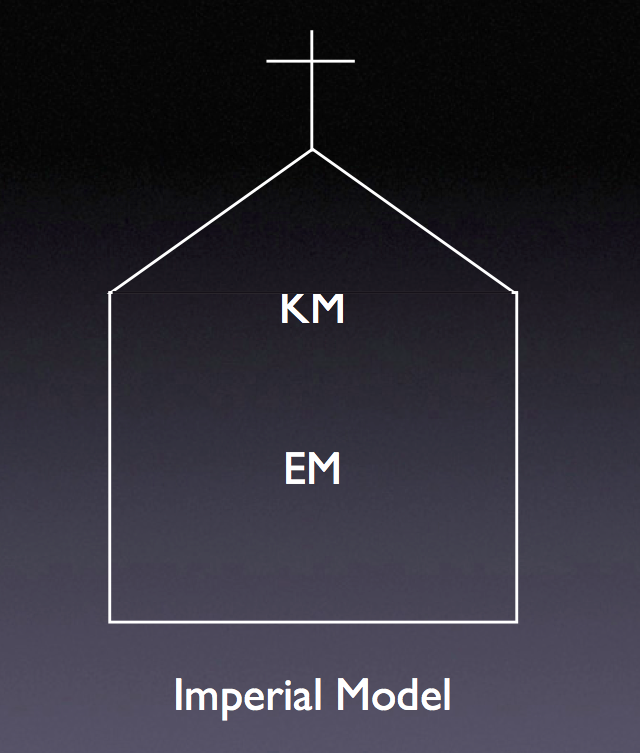 This eighth model, the Imperial Model, is typified by two congregations led by one bilingual pastor, who is able to lead a 1st or 2nd generation church. This is different from the Duplex Model or the Townhouse Model in that it is one church with two congregations, with one pastor over both congregations. This has been seen in some prominent Korean American churches, but we have also seen it in Chinese American churches as well. An ideal candidate for this singular pastor would be someone who is “1.5 generation”–that is, someone born overseas but relocated to the U.S. at a young age. A pastor like this is in touch with both the overseas-born generation and the American-born generation, and can minister to both groups. Thus, one pastor acts like a monarch over both groups. The entire church maintains the same vision because of a singular leader. The church model is one, and it is unified in structure. There is less potential for conflicts among staff because of one leader over all. The pastor is the spiritual leader that all congregants look to. He is like a monarch–an emperor who cares for all the people. All of them are part of his flock and are (potentially) cared for equally. This allows the pastor to seek what is best for the congregation. It does not allow for much difference generationally. As the congregations differentiate in terms of teaching, priorities, culture, and even music style, one or both of the congregations may not have the appropriate contexualization in ministry. It overworks the singular leader. Not only is the pastor overseeing a number of people, he is trying to shepherd congregants with different needs, different cultures, and different worldviews. It is a great deal for one leader to handle. Do you have experience in an imperial church? Are there any advantages or disadvantages you would add? Next Next post: Why Galatians 3:28 is a poor reason to condemn ethnic specific ministries.